RAWALPINDI, Pakistan (CNN) -- The office of Maj. Gen. Athar Abbas has a bank of six flat-screen televisions covering most of one wall, showing all the main international English-language news channels, and several local ones besides. 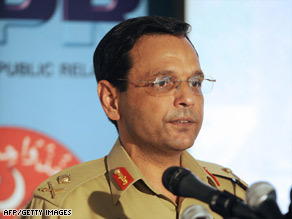 Major General Athar Abbas addresses a news conference in Rawalpindi on April 28, 2009. This is one of the rooms where Pakistan's media war is being fought, and Abbas, the Pakistan army's main spokesman, is a key part of the battle. I kid with him that CNN isn't among the channels on his screens, and he seems slightly hurt, insisting it is. He's right and I'm wrong -- CNN was on a commercial break. In fact, I rather get the impression Abbas, who has become the face of the army's operation against Taliban militants in the Swat Valley, watches our coverage closely. One of his subordinates complains about one of our reports -- not the accuracy, but something in the general tone. Perhaps CNN has been just a little too questioning of the army's daily press releases, which claim hundreds of enemy fighters killed, and tightly controlled media trips. Whatever Abbas thinks of CNN, he is more than willing to explain how the Pakistan army sees the broad picture as it fights in the Swat Valley. The current conflict there is intricately linked to the situation in Afghanistan, in his view. He sees Swat as a political problem, which can only be partially solved by military intervention. He claims many of the Taliban's arms are coming across the border from Afghanistan. I ask if that includes NATO weapons, as suggested in recent reports, and he agrees. He says Washington is too focused on the safety of Pakistan's nuclear arsenal. The United States should "stop worrying about the nukes and start worrying about the weapons lost in Afghanistan," he says. A U.S. government report last month warned that the Pentagon did not have "complete records" for about one-third of the 242,000 weapons the United States had provided to the Afghan army, or for a further 135,000 weapons other countries sent. The Afghan army "cannot fully safeguard and account for weapons," the Government Accountability Office found. I ask how well armed the Taliban are, and he says they are "very well equipped from the border area." He also conspiratorially suggests they also are getting weapons and support from "foreign intelligence agencies." When I ask what that means, he smiles and says he can't elaborate -- declining to repeat the speculation in the press here that India, Pakistan's traditional rival, may be somehow involved in stirring up trouble on Pakistan's northwestern border. But the very suggestion plays to a military strategist's nightmare scenario -- the Pakistan army bogged down in the northwest, unable to focus on the disputed province of Kashmir, a key element of its conflict with India. The military wants to get done in Swat as soon as possible, but the general acknowledges its troops will be there for some time. He estimates that 10 to 15 percent of the Taliban there are foreign fighters: "Well-trained Arabs, Afghans, with a sprinkling of central Asians and North Africans." He also says there are Yemenis, Saudis and Uzbeks fighting, as Pakistan has become the destination du jour of the international jihadist, with Arabs in commanding positions and the other foreign fighters bringing in expertise. He thinks that perhaps Mingora, the main town at the gateway to the Swat Valley, may be secured in 48 hours, but it may be much, much longer before the area is totally pacified. "First you have to disarm the Taliban and then re-establish the writ of government," he says. He admits that Swat and neighboring Bajur Districts "were lost to the state" and that now "we are paying in blood for areas we had already occupied." Now, he says, the army is set for a long fight. "We are prepared for that -- we are mentally prepared." But they are also prepared for the conflict to be taken to other parts of Pakistan. A building belonging to the country's powerful intelligence agency, the ISI, was bombed in Lahore this week. The Taliban claimed they carried out the attack and Abbas says the security services expect more attacks. Just hours after I left him, his fears were confirmed, as details came in of more bombings in Peshawar. And then there is also the risk of the Taliban using the mass exodus of civilians from the Swat Valley as cover to penetrate other towns and cities. Already almost 3 million people have flooded out of what was once a tranquil tourist destination, and the military fears that among the mass movement of humanity there will be those plotting to strike at the heart of Pakistan's cities. "It's a very big issue -- a serious concern," Abbas says. He describes the conflict in Swat as "an existential threat" -- a fight for the very existence of Pakistan in its current form. And he seems acutely aware that the portrayal of that conflict to the West will be critical.